Family planning goes digital! The Fertility App has been developed by Barbados Fertility Centre (BFC), and is described as the first app of its kind produced by a health care provider. The app has an ovulation calculator, which is connected to the calendar. This then syncs with the user’s device to send them alerts and reminders. The user can add appointments and medications and there is a full medical glossary explaining all the medical terms associated with both male and female fertility. There is also a full description of preconception supplements and medications and their effects on the body when trying to conceive. 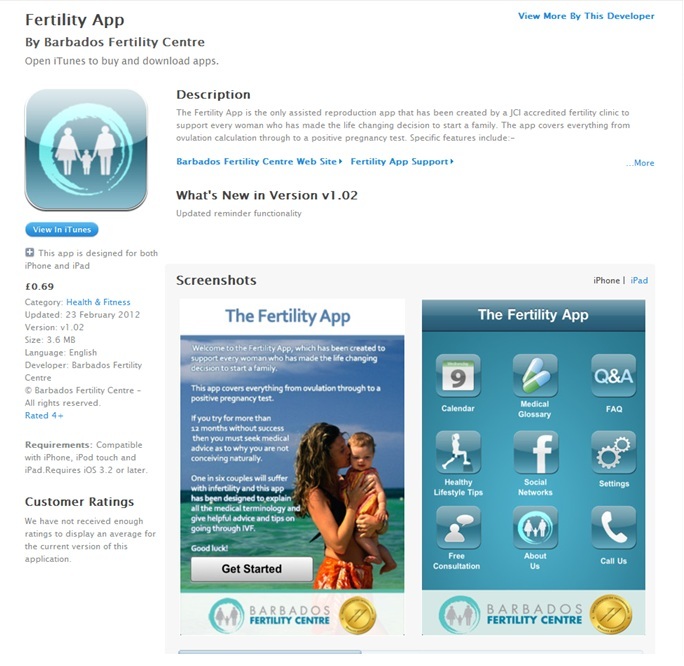 Veronica Montgomery, Marketing Manager at BFC said, “The app has been developed with every couple in mind who have made the life changing decision to start a family, we hope it will help couples conceive more easily and that they won’t need fertility treatment. However, the app covers everything about natural and assisted reproduction so that couple’s are aware of treatment options as well.” The app is available through Apple’s App Store. Would you use an app such as this? If you are a healthcare professional working with families trying to conceive, is this something you would suggest they use? Facebook got there first. So what? Last week, Facebook announced a new app feature that allows users to see their friends’ organ donation status. Shorty after that, SilconeCaribe.com posted an article about Xorgan (pronounced Zor-Gan), a social mobile app meant to increase the rate of blood and organ donation worldwide; it was being developed by St. Vincent-based entrepreneur Herbert (Haz) Samuel. Because Facebook launched their apps first, Samuel has decided to “move on to plan B” and possibly forgo development of his app. – Globalization is affecting social determinants of health and the health status of different population groups, within and between nations. – How can the action on the social determinants enhance those opportunities and reduce those risks? – Could the Rio+20 Conference strengthen opportunities and minimize the risks of globalization? How? Moderator: Dr. Kira Fortune, Regional Advisor on Determinants of Health, PAHO/WHO. They are entitled to a healthy and productive life in harmony with nature” – Principle 1 of the Rio…..” Declaration on Environment and Development, 1992. The Rio Declaration of 1992 recognizes that healthy populations are central to human progress and sustainable development, and remains equally true today. However, the economic pillar has been prioritized at the expense of the social and environmental pillars of sustainable development over the last few decades, becoming itself a source of volatility and destabilization. The United Nations Conference on Sustainable Development, Rio+20, now offers an opportunity to re-examine the relationship between health and sustainable development. The proposed SDE Seminar series towards Rio+20 aim at contributing to this important debate by bringing different themes of relevance to sustainable development and health to inform all areas of the Pan American Organization about the themes under discussion in the Rio Conference, but also to inform public health stakeholders and other decision makers in the health sector, to better take part in the debate. The SDE Seminar series will happen every Wednesday from 12 to 1pm (Washington time), from February 8 to June 13th. All Seminars will be life-streamed, and opened for participation in person at the PAHO/WHO HQ, or via Elluminate, or via telephone line.